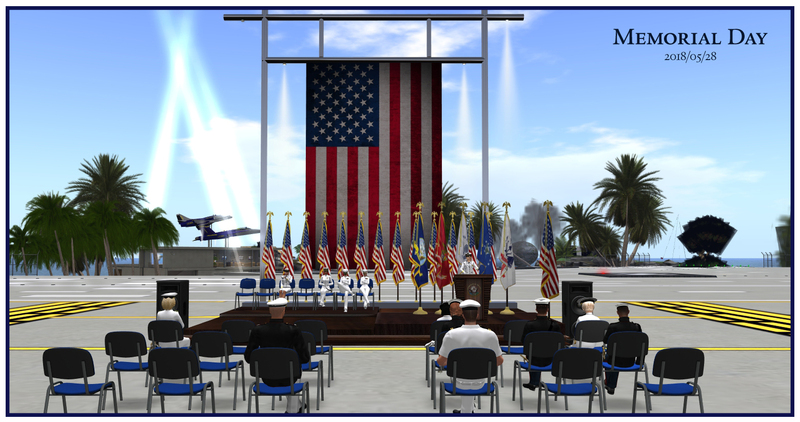 Observing today's remembrance, a Memorial Day ceremony took place at Naval Air Station Miramar, attended by SL US Navy and SL USMC service members from Third and Seventh Fleets, as well as USCG in SL members. Here is a record of the event. As usual, click on the images to enlarge. The guests started arriving early at Miramar. CDR. An Rainbow is escorted by CAPT. Vickster Kühn for the Memorial flight. 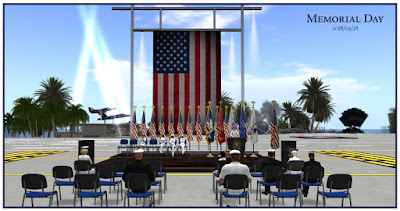 Miramar's main entrance was the stage of the ceremony. CAPT. Sidney Pobieski delivers her remarks. Good morning. I only found out I was going to speak about an hour ago, so I am going to have to be uncharacteristically brief. I should wrap this up in 45 mins or so. I was speaking with a woman at Church yesterday who is rather on in years, and she was lamenting that we no longer call today "Decoration Day". Which is used to be called until, I think, 1970, at which time it was renamed and moved to a Monday to give the Post Office a long weekend. A lot of people think Decoration Day refers in some way to military medals or badges. It does not. In fact the name came about when groups of women in the South began to "decorate" the graves of fallen Confederate soldiers in the years after the Civil War. In 1868, a group of women in northeastern Georgia were doing just that when they noticed the intended cemetery containing the graves of Union soldiers nearby. It was in sad disrepair and many of the women were appalled by this. So they took to "decorating" the graves of all fallen soldiers, (...). 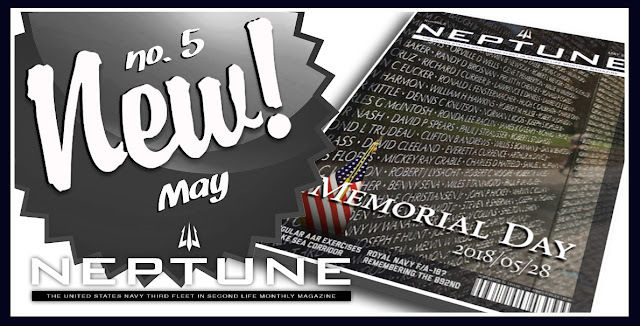 It caught on with a National Union Veterans Group and became a National Holiday from there, with the intent of caring for the physical graves and the communal memory of all soldiers who gave their lives in all wars. That is what we need to be remembering today. That real people, children often, died a real death so that we can behave as disgracefully as we do today - politically, socially and personally. We've made a game of it here, but its not a game to many families. So as you go about your SL military careers, try to do so in a way that reflects credit upon the institution and the people who have been part of it. I will conclude with this... "And the sea gave up the dead which were in it; and death and hell delivered up the dead which were in them: and they were judged every man according to their works." - Revelations 20:13. I do not concern myself that any of our war dead need be concerned when their time to be judged arrives. 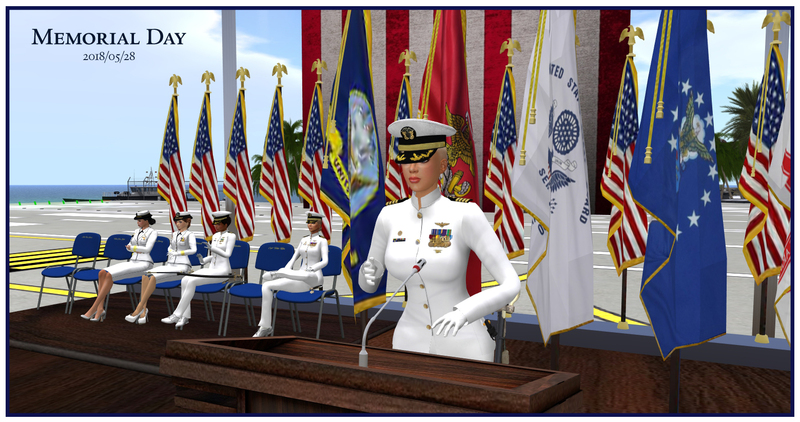 Senior Commanding Officers of the USS Kitty Hawk and NAS Miramar. CAPT. Vickster Kühn making her speech, after CAPT. Pobieski. 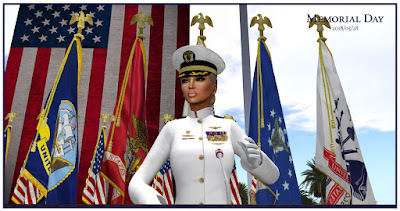 Thank you Captain Kron, thank you Captain Pobieski also.The fact is I know a lot of veterans and the fact is memorial day rooted in history though it is well, unfortunately, the roles of the honored dead continue to grow. All the lives spent on those battlefields - and lets face it not always well spent but honorably - and the shattered families who eventually heal and move on. It is not a game what we do if we do it right, its a living memorial to the men and women who served as well as those who died. It is rather Memorial Day every day for us if you push it that far because this place, this navy, is a living memorial and monument to them, and its appropriate to remember that it's done with reverence and respect. Thank you all for your attention. View of the ceremony ground with USCG vessels off the coast. 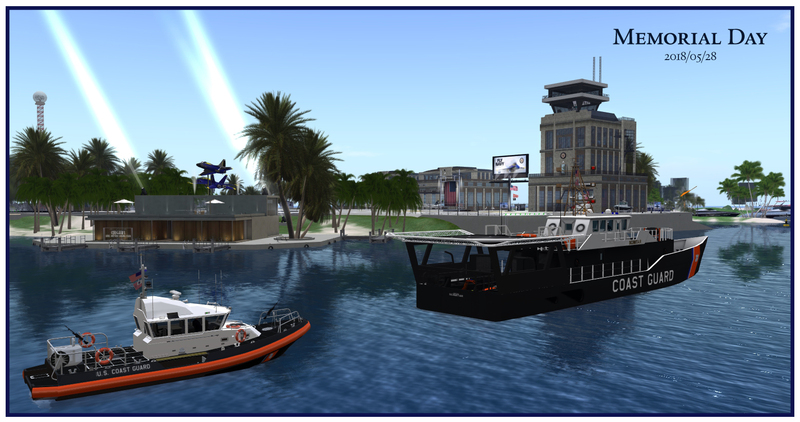 The USCG cutter "Scimitar" and a USCG fast boat joined the ceremony. CAPT. Asra Kron delivers the closing statements before noon. Thank you CAPT. Pobieski and CAPT. Kühn for your words. At this point we would have a chaplain come forward and grace us with his words as well, but unfortunately he is not available so I will close the remarks as we approach noon and the restoring of the flag to full staff. 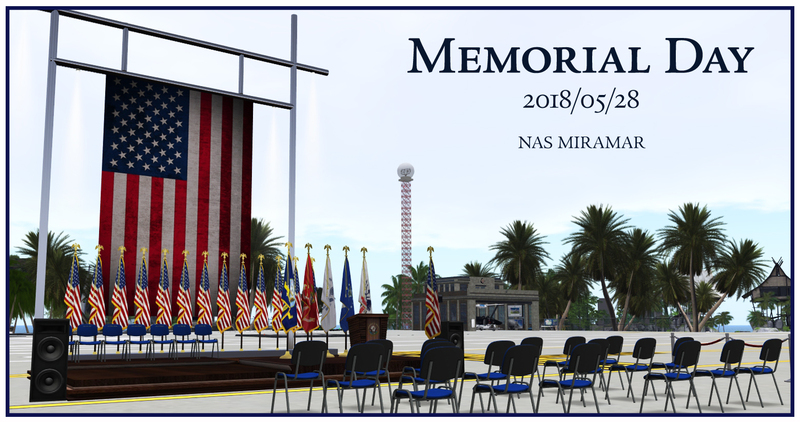 Distinguished commanding officers, fellow service men and women, ladies and gentlemen, thank you for joining us at Naval Air Station Miramar for this year’s Memorial Day ceremony. 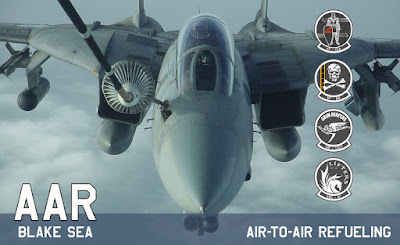 We are into our third year of existence and proudly look forward to many more, remaining one of the finest mirrors of the United States Armed Forces in this virtual world. As such we carry on our shoulders the responsibility of portraying the real life institutions we represent honorably and this particularly comes to mind in days like this one. Memorial Day is the time to celebrate the lives that were given for a greater cause in the ultimate sacrifice one can make for one’s country. We should remember those fallen heros always and not just today, but on this day we choose to collectively pause and think about their service and their precious gift to us all. Yesterday I placed a little flag on the grave of a family member who served in the United States Navy, like his father before him. It is a beautiful cemetery, very large and well kept, long and wide stretches of well tended grass with old luscious oaks. Very near is the military memorial site with all branches represented and an enormous American flag waving majestically up on high. It made me think of what I wanted to say to you today. 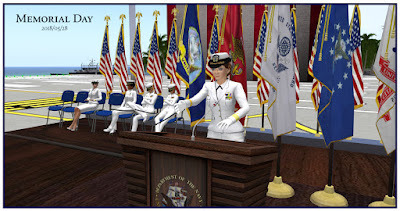 We honor all those who served, and neither of my Navy family members lost their lives in the line of duty, but today in particular we honor those who did so, and in honoring them we must also remember what their sacrifice was for. We live in controversial times, difficult times. We are faced every day with a myriad of news that tell us of a troubled world and a troubled country, where so many are pitched against each other and fail to find common ground. In such times we must hold ourselves in an even higher standard and stand fast for what we believe in and represent. The lives selflessly given by those whose memory we honor today were given for what our country stands for, above all freedom. Freedom that is ensured by a system that at its core has both democracy and the rule of law, for you can not have a free society without representation and justice. In these troubled times we must stand fast in the defense of these values and what makes them possible, and more than ever represent our real life mirrors with dignity and pride, but also with humility and responsibility. This is what gives the sacrifices we honor today meaning and does them justice. 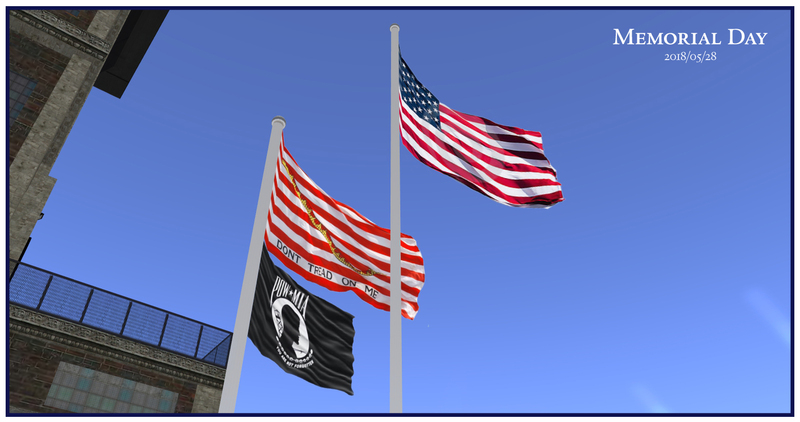 In remembrance of our fallen service men and women we had our flags at half staff for the first twelve hours of the day. 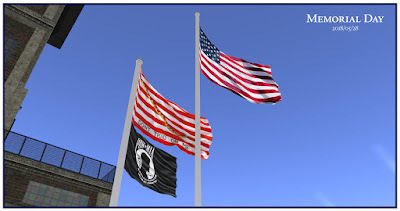 We shall now restore the flag to full staff so it waves high proudly once more. Remember this when you look at it. Remember what it means. Lest we forget. Miramar's flag was raised to full staff at noon as the National Anthem played. 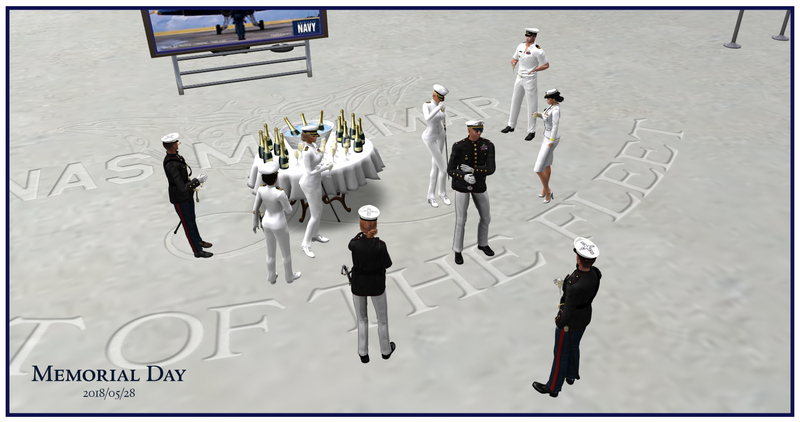 Gathering for champagne at the end of the ceremony. A fine day it was. 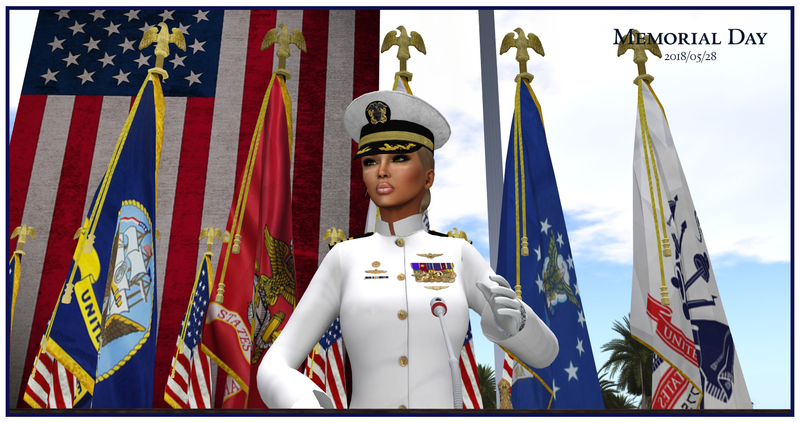 Thank you to all the US Navy, US Marine Corps and US Coast Guard in Second Life service members who attended this ceremony. 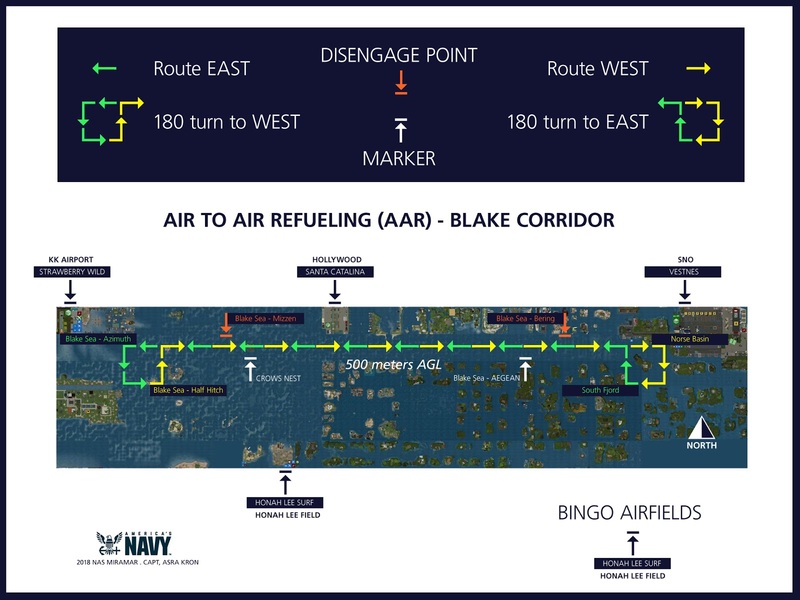 Today there will be an air-to-air refueling exercise on the Blake Sea corridor (see route map below). This exercise is a regular event organized by USN 7th Fleet SL with Third Fleet participation. 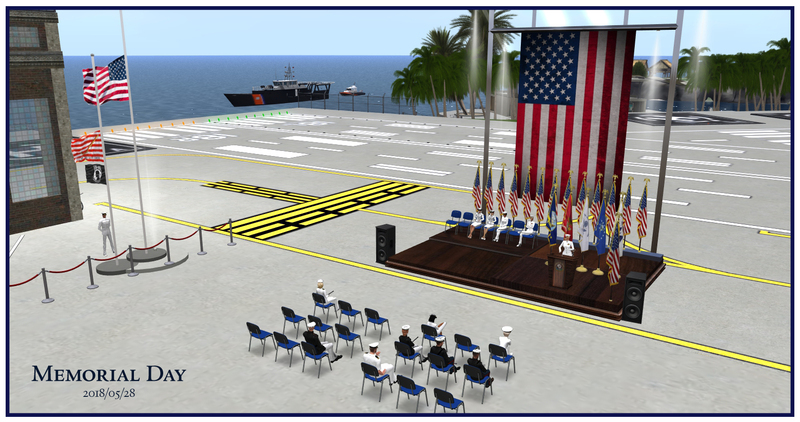 Briefing for the mission will take place at NAS Miramar's Map Room. 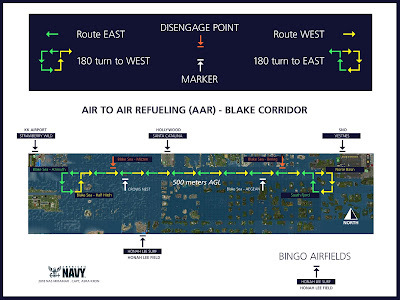 Participating squadrons from both fleets will take off from Miramar and the tanker(s) from SNO. 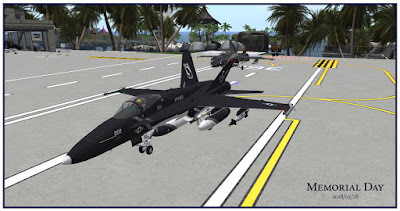 Meeting at NAS Miramar for debriefing at 1430 Hours SLT (2:30 pm). A ceremony dedicated to our veterans and fallen heroes will take place at NAS Miramar on Memorial Day, Monday, May 28, at 11:00 SLT. 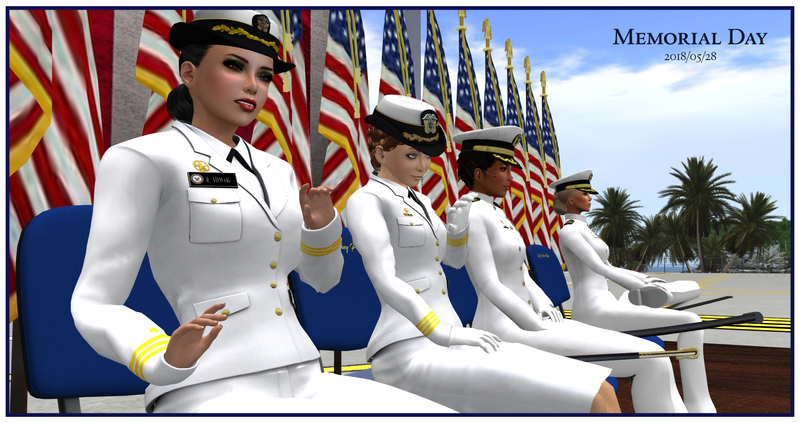 Dress code is full dress whites (gloves, sabres, medals and ribbons - NO name tags). If you plan to attend be early - Du Sud region capacity is 20 people. 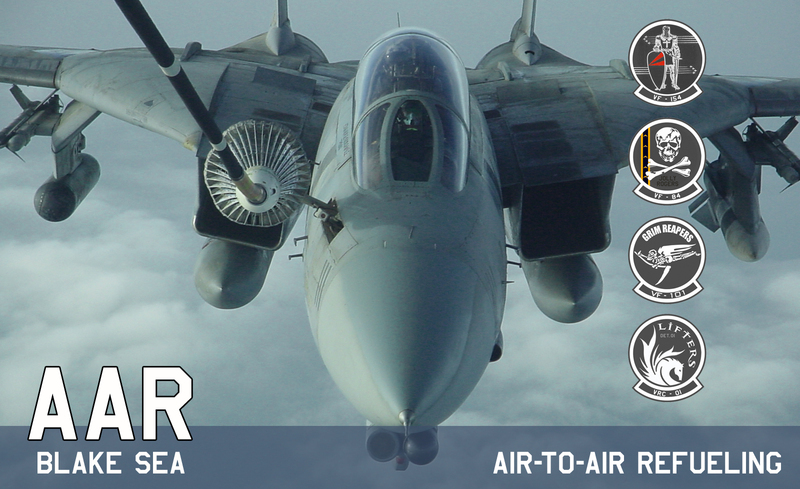 There will be a fly by with aircraft from NAS Miramar at the start of the ceremony, after which they will land on site so the aviators can join the ceremony for the National Anthem and senior officers' remarks on Memorial Day, its meaning and observance, and the return of the flag to full staff at noon. By order of the President of the United States, in accordance with Section 6 of the U.S. 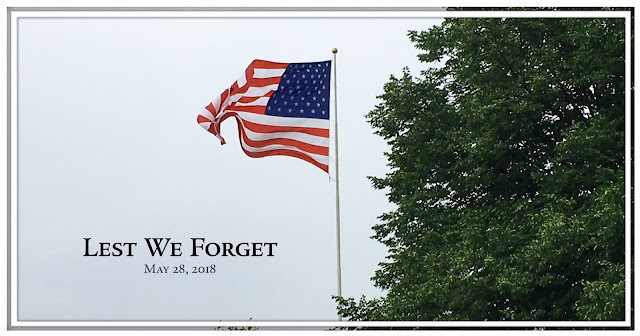 Flag Code, all flags at all State facilities are to be flown at half-staff on Monday, May 28, 2018 until noon that same day in recognition of Memorial Day.For locations that display illuminated flags that remain up at all times, these flags need to be lowered to half-staff for the morning of May 28, 2018 and returned to full staff at noon that same day. For flag locations at which the flags are not illuminated or for other reasons are raised and lowered each day, the flag, when flown at half-staff, should be first hoisted to the peak for an instant and then lowered to the half-staff position, and returned to full staff at noon.